I've been feeling pretty lackadaisical for the last few days, this post should have gone up on Wednesday but I just couldn't bring myself to summon the energy to sort the photos and write the post, I know, I know, it doesn't take that much energy to type but I think I have used up all my spoons for this week. 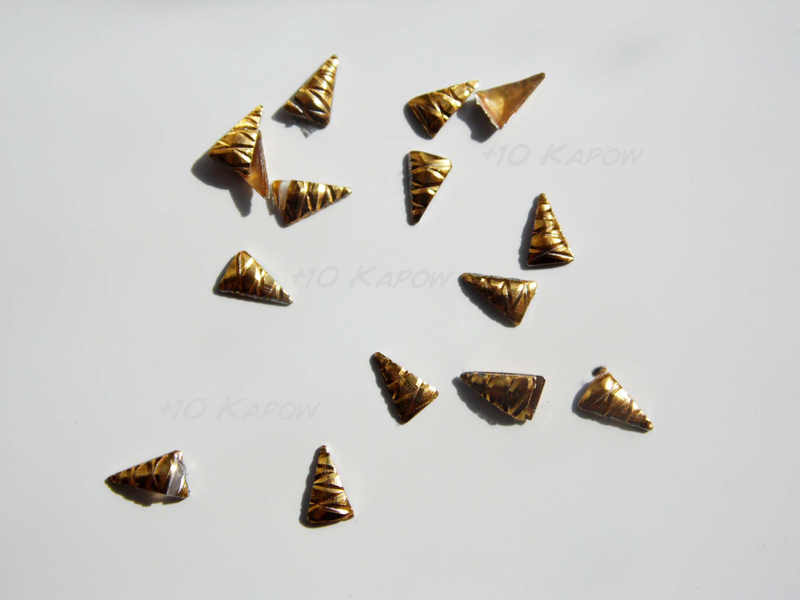 I refuse to allow myself to slide into another blog slump though and so here is the post on some Born Pretty Store triangle nail studs. These triangular studs have kind of a ribbon, criss cross imprinted pattern across them and each stud is about 3/4mm in length. I had a slightly different mani planned for these studs, only very slightly, but when I went to apply the studs I realised that they weren't going to sit flat across my nails, this might not be a problem for peoples with flat nails but for those of use with fairly curved nails, it can be somewhat of a niggly little issue. You can see on one of the studs on my thumb how the end is raised up, they sit just fine when pointing down/up the nail à la my ring and pinkie. There are studs out there for all kinds of nail art, but gold studs of any shape or size still look best over a dark base in a kind of subtle rock chick style and that is kind of what I was trying to go for here. The base polish is OPI 4 In The Morning and the cross images are stamped from Born Pretty Store BP-L012 stamping plate using Models Own Rose Chrome. I did apply Seche Vite to each nail and then I added OPI Matte Top Coat to the index and middle finger, it gave a great contrast and made the mani a little bit edgy but I couldn't for the life of me pick that up in the photos, so just imagine that it was awesome. You can find these studs here for £1.21 ($1.85) for 50 studs. 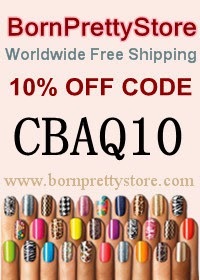 Don't forget as always to use my code CBAQ10 for 10% off your basket amount. Have you had a good week so far? What nails are you doing for the bank holiday/normal weekend? The studs in this post were sent to me for review purposes. All opinions expressed are my own, honest opinions.